This is “Introduction”, section 9.1 from the book Getting the Most Out of Information Systems: A Manager's Guide (v. 1.0). For details on it (including licensing), click here. Recognize the importance of software and its implications for the firm and strategic decision making. Understand that software is everywhere; not just in computers, but also cell phones, cars, cameras, and many other technologies. Know what software is and be able to differentiate it from hardware. List the major classifications of software and give examples of each. We know computing hardwareThe physical components of information technology, which can include the computer itself plus peripherals such as storage devices, input devices like the mouse and keyboard, output devices like monitors and printers, networking equipment, et cetera. is getting faster and cheaper, creating all sorts of exciting and disruptive opportunities for the savvy manager. But what’s really going on inside the box? It’s softwareA computer program or a collection of programs. It is a precise set of instructions that tells hardware what to do. that makes the magic of computing happen. Without software, your PC would be a heap of silicon wrapped in wires encased in plastic and metal. But it’s the instructions—the software code—that enable a computer to do something wonderful, driving the limitless possibilities of information technology. Software is everywhere. An inexpensive cell phone has about one million lines of code, while the average car contains nearly one hundred million.R. Charette, “Why Software Fails,” IEEE Spectrum, September 2005. In this chapter we’ll take a peek inside the chips to understand what software is. A lot of terms are associated with software: operating systems, applications, enterprise software, distributed systems, and more. We’ll define these terms up front, and put them in a managerial context. A follow-up chapter, Chapter 10 "Software in Flux: Partly Cloudy and Sometimes Free", will focus on changes impacting the software business, including open source software, software as a service (SaaS), and cloud computing. These changes are creating an environment radically different from the software industry that existed in prior decades—confronting managers with a whole new set of opportunities and challenges. Managers who understand software can better understand the possibilities and impact of technology. They can make better decisions regarding the strategic value of IT and the potential for technology-driven savings. They can appreciate the challenges, costs, security vulnerabilities, legal and compliance issues, and limitations involved in developing and deploying technology solutions. In the next two chapters we will closely examine the software industry and discuss trends, developments and economics—all of which influence decisions managers make about products to select, firms to partner with, and firms to invest in. When we refer to computer hardware (sometimes just hardware), we’re talking about the physical components of information technology—the equipment that you can physically touch, including computers, storage devices, networking equipment, and other peripherals. Software refers to a computer program or collection of programs—sets of instructions that tell the hardware what to do. Software gets your computer to behave like a Web browser or word processor, makes your iPod play music and video, and enables your bank’s ATM to spit out cash. It’s when we start to talk about the categories of software that most people’s eyes glaze over. To most folks, software is a big, incomprehensible alphabet soup of acronyms and geeky phrases: OS, VB, SAP, SQL, to name just a few. Don’t be intimidated. The basics are actually pretty easy to understand. But it’s not soup; it’s more of a layer cake. Think about computer hardware as being at the bottom of the layer cake. The next layer is the operating systemThe software that controls the computer hardware and establishes standards for developing and executing applications., the collection of programs that control the hardware. 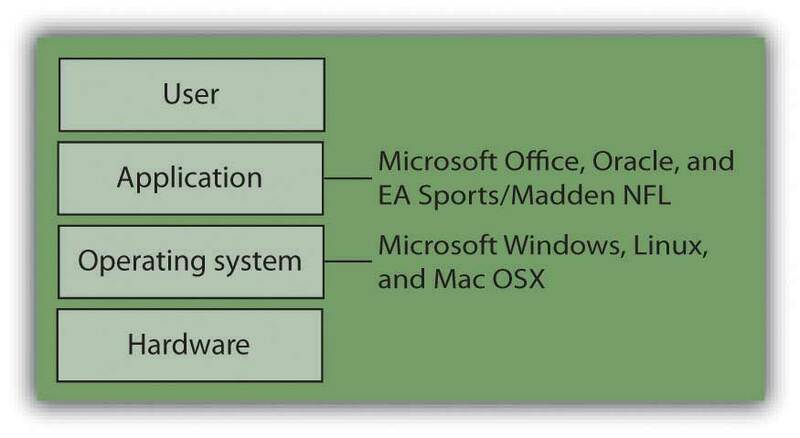 Windows, Mac OS X, and Linux are operating systems. On top of that layer are applicationsIncludes desktop applications, enterprise software, utilities, and other programs that perform specific tasks for user and organizations.—these can range from end-user programs like those in Office, to the complex set of programs that manage a business’s inventory, payroll, and accounting. At the top of the cake are users. The flexibility of these layers gives computers the customization options that managers and businesses demand. Understanding how the layers relate to each other helps you make better decisions on what options are important to your unique business needs, can influence what you buy, and may have implications for everything from competitiveness to cost overruns to security breaches. What follows is a manager’s guide to the main software categories with an emphasis on why each is important. Software refers to a computer program or collection of programs. It enables computing devices to perform tasks. You can think of software as being part of a layer cake, with hardware at the bottom; the operating system controlling the hardware and establishing standards, the applications executing one layer up, and the users at the top. How these layers relate to one another has managerial implications in many areas, including the flexibility in meeting business demand, costs, legal issues and security. Software is everywhere—not just in computers, but also in cell phones, cars, cameras, and many other technologies. Explain the difference between hardware and software. Why should a manager care about software and how software works? What critical organizational and competitive factors can software influence? What role has software played in your decision to select certain products? Has this influenced why you favored one product or service over another? Find the Fortune 500 list online. Which firm is the highest ranked software firm? While the Fortune 500 ranks firms according to revenue, what’s this firm’s profitability rank? What does this discrepancy tell you about the economics of software development? Why is the software business so attractive to entrepreneurs? Refer to earlier chapters (and particularly to Chapter 2 "Strategy and Technology"): Which resources for competitive advantage might top software firms be able to leverage to ensure their continued dominance? Give examples of firms that have leveraged these assets, and why they are so strong.